Despite being one of the most elaborately decorated pages in the volume, this leaf has a prominent natural hole in the middle. Such holes were a common feature of parchment produced outside the most professional centres. 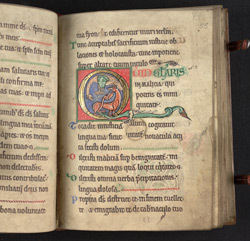 The initial is inhabited by a bird and a quadruped, both curved to follow the shape of the initial 'Q', whose tail is made up of a dragon.